Imagine that moment when you take out your phone from your pocket, bag or wherever, blow air on it and it unlocks automatically. Now, that sounds like a good deal right? Oh well, here’s the new thing. You can now simply unlock your android phone by blowing air on the screen and if blowing air on your phone seem kinda awkward to you, there’s an alternatively, you can shake to unlock. your friends as bossy you could be when it comes to tweaking your android device. 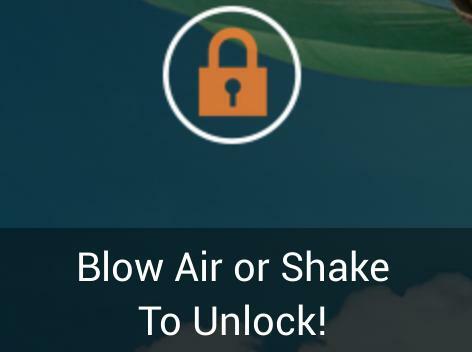 The Blow Air On Screen App Is Supported On Which Devices? Java, symbian, iPhone and iPad users shouldn’t bother either unless they want to blow their phone away LOL. How Do I Download and Install This App? It can be downloaded and installed just like any normal app and it does not require you rooting your phone before been able to use. Make sure to allow ‘Installation of app from unknown sources’. Download Here and tap the pad lock to enable the functionality. You can choose to start blowing your android phone to unlock it now but please try not to blow spit on it LOL.